Sign up at Amazon.com NOW for Rika’s new book: NOURISH, HEAL, THRIVE:A comprehensive and holistic approach to Living with Lyme disease. Your specific dietary needs are addressed from a holistic and functional perspective. 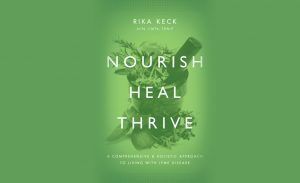 Rika Keck is an expert investigator of root causes resulting in headaches and migraines, hormonal imbalance, digestive troubles associated with acid reflux, microbial overgrowth, antibiotic use with Lyme disease, and auto-immune illnesses such as Hashimoto’s, IBS, Ulcerative Colitis and Crohn’s. There is no quick fix when it comes to ongoing stomach and digestive troubles. It is a long term process with multiple layers, especially if additional gut testing is required. Our gut affects our immune function, mental outlook, inflammation, hormonal balance, bodyweight and vitality. Take care of your gut – you only have one! Contact Rika to discuss your concerns.